Our 2017 Grenache is made from vines organically grown on our two-plus-acre parcel named Bobcat Run. This block takes its name from a large resident feline that treats us to an occasional sighting. The site is ideally suited for growing Rhone varieties as it lies in a fairly cool hollow open to the southwest, and its rows run north-south for good sun and warmth without excessive exposure. The cooler conditions in Bobcat Run produce fruit with a great depth of flavor, adding nuance and complexity to the intensity of the fruit from China Bowl. Coming off significant rain falls in Northern California following a five-year draught, reservoirs, ground water and soil were replenished. The early 2017 growing season was perfect for wine grapes and the weather was dry with eventual warm spurts in August & September setting up a normal paced harvest. Just about one ton of the grapes were hand-picked on September 15, 2017. October’s wildfires in Sonoma luckily did not adversely affect our vineyards and winery. As grape varieties go, Grenache is grown and made into wine pretty much all over the world. Winemaker’s stylistic intent will dictate the outcome more than the grape. 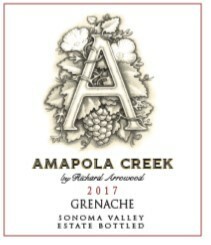 Winemaster Richard Arrowood again demonstrates finesse with this fresh and floral, easy-drinking wine that is more akin to Beaujolais than to the ultra-ripe expressions of Grenache that can be syrupy, thick and sweet with jammy fruitiness. The color is an appealing bright red with a bit of purple core. The nose opens with a host of subtle aromas, graham cracker and anise, fresh rainier cherries, raspberry, and a hint of vanilla. The palate starts softly, with a hint of fresh red fruit and a wisp of spice. Wait a moment, and you will find that this wine opens grandly on the palate, a slow burn revealing gobs of bright red strawberries, supported by a subtle toast and balanced perfectly against an exquisite acidity. The finish is long and lingering, uncovering a trace of purple fruit and just the barest hint of the spice hinted at on the nose.